New orders for manufactured goods fell by 0.6 percent in November, extending the 2.1 percent decline seen in October. In addition, new orders for core capital goods (or nondefense capital goods excluding aircraft) -- a proxy for capital spending in the U.S. economy -- continued to pull back from the all-time high reached in July. This suggests some softness in capital spending in the economy, which is disappointing. Retail trade -- December retail sales data will be released next week on February 14. Real GDP by industry -- This will now be released on February 21 for the third quarter. Manufacturing had value-added output of $2.33 trillion in the second quarter of 2018, an all-time high. Personal income and spending -- BEA will now release this data, along with the personal consumption expenditures (PCE) deflator, on March 1. That release will include personal income data for both December and January. International trade in goods -- The December trade data will now come out on March 6, about a month later than normal. 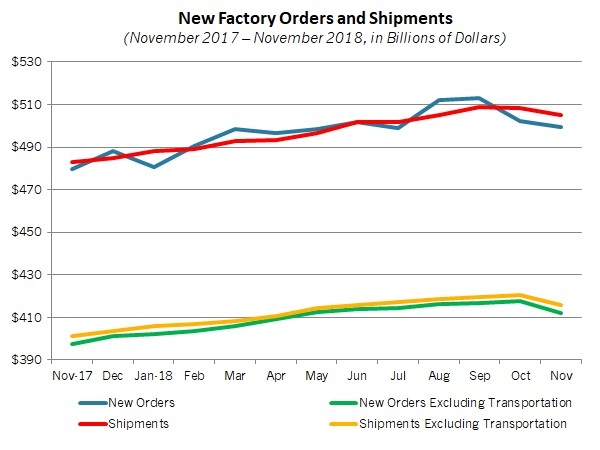 This will give us our first read on U.S.-manufactured goods exports for 2018, with updated seasonal adjusted data released on TradeStats Express subsequent to that. MEMA Industry News Editor’s Note: As an added member benefit, MEMA includes the NAM Monday Economic Report, a compilation of current economic indicators, in MEMA Industry News each week. The full Report is available here.